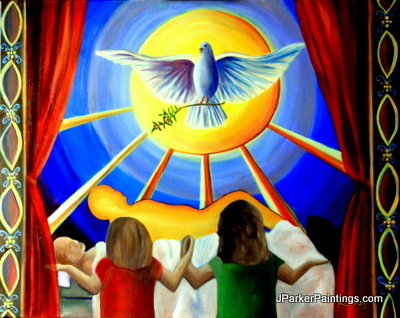 Divine Presence paintings are stories from different Christian faiths and sociological backgrounds. Jennifer has found that people have been scared to share their divine experiences in fear of how they will be depicted among society or even in the church. These individuals strongly believe in what they have seen, heard and experienced. They recognize these experiences as blessings and sacred moments in their life. If you have a story and would like to share it, please contact Jennifer for an interview at jparkerpaintings@gmail.com. Paintings are shown below and to read their stories, please attend a gallery exhibit near you.